QINGDAO, China, Sept. 11, 2018 /PRNewswire/ -- The Information Office of the People's Government of Shandong Province invited foreign journalists to witness firsthand the advances of Qingdao in recent years. "Normally, seaports are crowded and noisy," said British journalist Christopher Aleksi Georgiou at the fully automated container terminal of Qingdao Port in east China's Shandong Province. "I'm amazed at how the terminal is operating in such an orderly manner with nobody in sight." Indeed, the terminal has become very efficient with state-of-the-art technologies such as big data, cloud computing and the Internet of Things (IoT). Georgiou was pleasantly surprised to learn that cargo could be transported from Qingdao to Amsterdam in only 15 days. He and other foreign journalists saw for themselves Chinese efficiency in action. A journalist snaps a photo of the production line of CRRC Qingdao Sifang Company. Qingdao Port is an important hub on the Belt and Road and an international maritime transport hub on the Pacific Ocean. Its container terminal, Asia's first fully automated terminal, began commercial operation in May 2017. According to Luan Baobo, deputy general manager of the terminal, the terminal has been operating at 30 TEUs per hour, a lot more efficient than traditional labor intensive terminals. The average efficiency of individual cranes is 50 percent higher than the average in the world. Buffet Julien from France compared the terminal with Le Havre, an intelligent port in northern France, and expressed hope that the two intelligent ports can get connected for better interconnectivity. 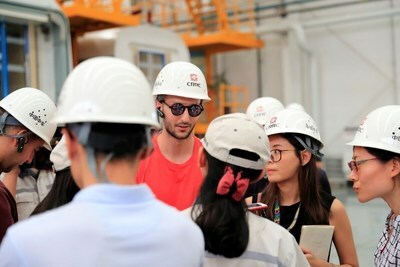 The foreign journalists also showed interest in CRRC Qingdao Sifang Company, where they visited the production line of high-end coaches/passenger cars, which produced China's first EMUs (electrical multiple units) designed to travel at speeds of 200 km/h, 300 km/h and 380 km/h, respectively. The company was also the producer of China's first Fuxing EMUs and first inter-city bullet trains. Greek journalist Vasilis Trigkas believes favorable industrial policy and long-term strategic economic planning have contributed to China's railway success. With its advantage in the scale economy, a country supported by smart industries can provide better, more affordable goods for other markets in the long run, he asserted. He believes the EU should promote its scale economy by planning its own industrial policies and increasing its domestic productivity, rather than closing its doors to international competition and rejecting market competition. Sifang has established overseas R&D centers in Germany, the UK and Thailand, attracting global human capital and providing jobs for foreign markets. At Haier COSMOPlat, the world's leading internet platform, journalists were impressed with the unique digital business model that is geared towards the mass individualization instead of traditional model of mass production. The foreign journalists felt China's future development will not simply depend on first-tier cities like Beijing and Shanghai. Second-tier cities like Qingdao are also on their way to comprehensive development. They agreed that Chinese economy will continue growing, and deeper reform and opening-up will be the key driver.